Internationally recognized muralist Judy Baca, visionary entrepreneur and telecommunications pioneer Paul Jennings, and acclaimed film and television director Donald Petrie will receive one of the university’s highest honors, the Distinguished Alumni Award, on April 18. 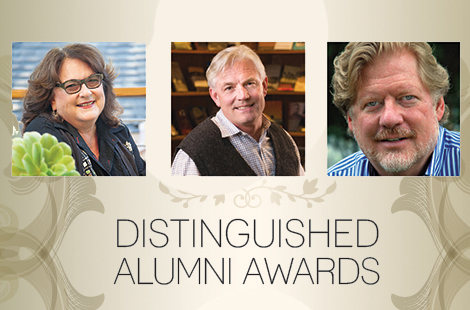 Read more about the Distinguished Alumni Awards. Since 2006, the Cal State D.C. Program has given students the opportunity to spend a semester studying and working in the world of politics in our nation’s capital. With the number of participants growing, CSUN students are becoming a powerful force in Washington, D.C. Read more about the D.C. Internship Program. The rigors placed on the modern student-athlete can be daunting, which is why CSUN Athletics recognizes scholar-athletes at the annual Varsity N Recognition Ceremony. Read more about scholar-athletes. Sat., April 11, 2 p.m. Thu., April 16, 7:30 p.m.
CSUN’s Department of Police Services will show off its tough but lovable K-9 unit dogs at the second annual Meet The Dogs event on April 15. The event also supports the CSUN K-9 unit by selling “dog-friendly” merchandise. CSUN offers a series of youth enrichment programs and camps for elementary, middle and high schoolers to mature socially and academically .